You've seen his face on television and heard his voice on the radio, he is: The most interesting man in the world. We sit down with the actor behind the character, and discover the real man is just as interesting. He’s Ernest Hemingway, Don Draper, Chuck Norris and your dad combined. He’s the Most Interesting Man in the World, and he’s played by Jonathan Goldsmith, a hardworking actor whose real life just might be worthy of the Dos Equis commercials he’s known for. Born in New York, Jonathan got his start in Westerns, most notably as a bad guy opposite John Wayne in the 1976 film The Shootist. He’s also been a fixture in a number of classic TV shows, playing guest roles on shows like Hawaii Five-O, MacGyver, Magnum, P.I., The A-Team, Knight Rider, CHiPs and Charlie's Angels. Since Primer counts a number of aspiring interesting men among our readership, we thought it would be instructive to pick the brain of the man behind the Most Interesting Man in the World. Primer: Tell me about how you got the role. You mentioned on The Adam Carolla Show that the audition called upon an actor who had improvisational skills. How’d you nail it? Do you remember what line you used? P: Tell me about some of your childhood heroes. Did they inspire the Most Interesting Man in the World’s character at all? I noticed that many of the clips from the commercials seem to be set in earlier decades. Is there something inherently more interesting and classy about the men of yore? JG: Well, I would have to begin with Jackie Robinson. I look up to him mainly because of his guts and humility. I also grew up admiring Floyd Patterson, who was tough and a gentleman at the same time. Franklin Roosevelt, Abraham Lincoln, Jack London, Winston Churchill… the list goes on. 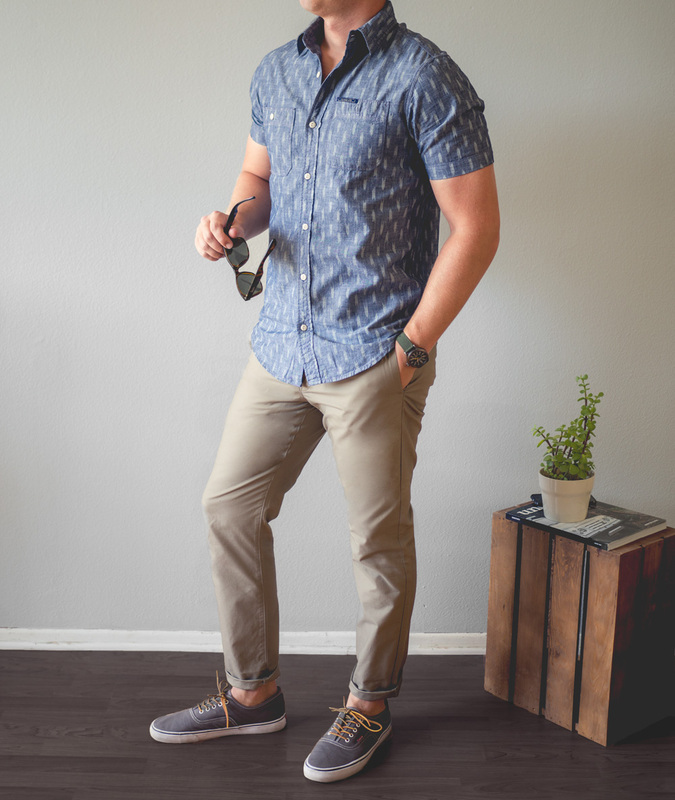 This look was put together exclusively with items available on Amazon Prime. Click here to check it out. Yes, I do believe times are much different now. Back in those days the personality qualities of a person came from actual experience. It came from the application of learned skills from reading, being engaged in struggles and overcoming obstacles. Compare this to today, where anyone—regardless of ability, talent and comportment—can take a crash course in just about anything in just moments on the internet. This has in many ways shortened and changed the seat of the pants of people to educate oneself. An example would be reading classic comic books instead of the classic novels themselves. I believe that there are too many shortcuts; one can pick up the appearance of success through material things and the so-called visual accouterments of success. Reading has stopped. It is now entirely a shortcut world. Unfortunately, looking cool is far more important than being truly cool—I could write a book on the changing world and its values. P: Although the Most Interesting Man in the World is pure legend, you as an actor were undoubtedly faced with some very interesting challenges while shooting the commercials. Interacting with various wild (and dangerous) animals, rock climbing, exotic travel, etc.—do these experiences top your personal list of “Most Interesting Things You’ve Done?” Do you have other real life experiences that are worthy of a Dos Equis commercial? What are some of your most impressive real life talents? JG: I am generally very comfortable with animals. I had moments of some concern on set with the cougar looking straight into my eyes while hissing at me, as well as with an owl that was perched on my arm and could have done major damage in an instant! His talons were as big as a Buick. I do like the physical challenge that is associated with these commercials. And as always, travel and change is intriguing. However, a commercial does not top my other experiences one bit. My saving a man’s life on Mt. Whitney in a snowstorm, saving a little girl from drowning in the ocean as well as a dog who fell through the ice is much more important to me. I’ve been fortunate to have had the opportunity to work with disabled and at-risk children since I was 18… and that was a long time ago. I started working with disabled children, children in protective custody from their own parents and children who were in prisons as violent offenders. I have also been involved as a founding member of Free Arts for Abused Children. It is composed of artists in many mediums, who bring art programs to various institutions providing a non-threatening environment for the young people to express themselves. Through art, their social workers and counselors can frequently gain insight that helps the healing process. P: You’ve done extensive work shooting westerns in the 70s. How does the stunt work compare to modern, higher budget shoots? What was more daunting, letting John Wayne shoot you in the face seven times or springing a grizzly bear from a trap? JG: Stunts are always dangerous, but precautions and equipment have greatly improved. The higher the budget, usually the higher the level of safety. As for John Wayne and the bear, I will take the bear any day! P: You live on your own sailboat with very few belongings and, as I’d imagine, even fewer daily human interactions. Can you talk a bit about why you chose such a minimalist lifestyle? What’s a day in the life like on the open sea? What kind of interesting experiences can you have secluded at sea that you can’t in the hustle and bustle of the city? JG: I love solitude, and I prefer the sounds of nature to that of people, traffic and hub bub. I try to surround myself with things that are important to me sensually, emotionally and that involve significant aspects of my life, not just clutter of little value and importance. I am not much of a materialist – I try to be surrounded with things only that are important to me on many levels. P: What kind of women get to sit around the table with the Most Interesting Man in the World? What does the Most Interesting Man in the World find interesting in a woman? JG: Whoever they hire usually (laughs). What I find interesting is intelligence, mystery, capriciousness, and confidence, as well as a look with an edge to it. Physical beauty is acceptable as well. P: You say it yourself: “I don’t always drink beer…” So, what does the Most Interesting Man in the World drink when it’s not a Dos Equis? There’s much conjecture that he’s a scotch man. Is there any truth to that? JG: Yes, I also like a martini, two olives stuffed with feta cheese. No Vermouth. I drink scotch as well (Laphroaig) and Johnny Walker Black. P: I’ve also heard that you’re a cigar aficionado. Tell me about how you enjoy your favorite cigars. JG: I like the Romeo Y Juliettta Reserve, Arturo Fuente and I also enjoy La Aurora with a good Armagnac after a fine meal. P: The Most Interesting Man in the World has already achieved everything worth achieving. But what’s on the horizon for the esteemed Mr. Goldsmith, career-wise? Do you think you’ll be able to portray a character who doesn’t represent the pinnacle of worldliness and potency? JG: Comedy! I certainly can play the everyday man as that is who I really am. But let’s not let that out of the bag. P: We’re pleased to see that the rumors of your death in April 2011 were greatly exaggerated. Any explanation for this? Maybe bad journalism? A prank? A mystery? At any rate, how do you keep yourself so hale and hearty? JG: The only thing I have to say is that the reports of my death are amusing – as are all the other fallacious rumors about me. To keep healthy I love working outside, be it on my boat or on my farm in New England. Cutting and splitting wood, building stone walls and pulling brush has to be the greatest core exercise of all. After that, I go to the gym 6 days a week: ¾ hour cardio, ½ hour on the mat and then high reps with low weights 3 times a week. And of course in addition to the Dos Equis, a daily cigar and martini (please don’t forget the stuffed olive). We also recommend Primer’s own guides on whiskey, fine cigars, martinis and women. Stay thirsty, my friends! 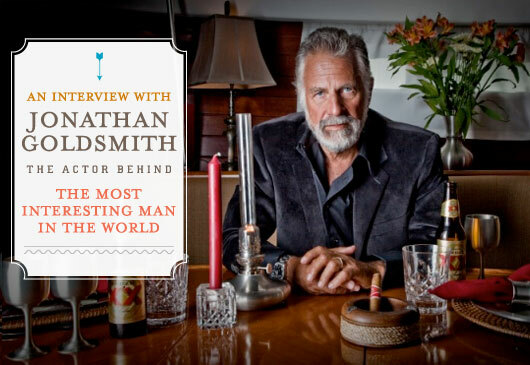 Jonathan Goldsmith is an awesome man! I just wish I will have the chance to shake the hand of the most interesting man in the world. That would be one of the best days of my life. I love the humor of this man. He looks like a serious man but seeing on his interview he is a happy and fun to be with type of guy. He looks weird to me, but I like his personality. It will be an honor to meet that man. i have meet jonathan and his wife personally and they are very kind and welcoming. If I only I could spend an hour alone with him…. He also was on the original Star Trek in a brief one second cameo. Shatner AND The most interesting man in the world in the same scene. Television has been downhill ever since. Love hi, I chose his costume for Halloween. Like it? Nice interview, the actual man seems as — if not more — interesting than his persona. Glad to see.